Frazer Harrison/GettyMatt Damon and Ben Affleck. Ben Affleck, Matt Damon, and Fox are making a movie based on the viral true-crime story of a former cop who reportedly rigged McDonald’s Monopoly game for $US24 million over 12 years. 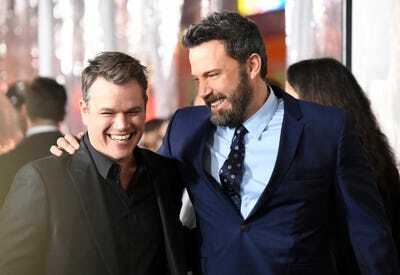 Affleck will direct and Damon will star in the film based on a report by The Daily Beast published last weekend. The article detailed the story of how Jerry Jacobson, a former police officer, was found to be at the heart of a criminal scheme that led to the conviction of more than 50 people for mail fraud and conspiracy in 2001. Ben Affleck, Matt Damon, and Fox have secured the rights to make a movie based on the true-crime story of a former police officer who reportedly rigged McDonald’s Monopoly game for $US24 million over the course of 12 years, Deadline reports. The article detailed the convoluted story of how Jerry Jacobson, a former police officer, was found to be at the heart of a criminal scheme to defraud $US24 million in winning McDonald’s Monopoly pieces from the company. The wide-ranging scheme led to the conviction of more than 50 people for mail fraud and conspiracy in 2001. The scheme began in 1989 with Jacobson working as a director of security at an agency that worked with McDonald’s, where he was in charge of overseeing the printing of the game pieces for the Monopoly promotion. “Deadpool” screenwriters Paul Wernick and Rhett Reese will write the film’s script, while The Pearl Street will produce the film, Deadline reports.